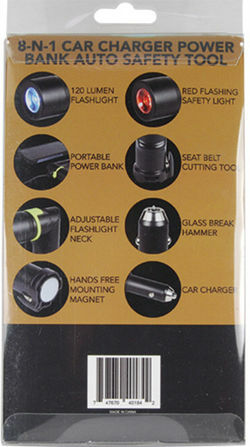 8-N-1 Car Charger Power Bank Auto Safety Tool has 8 functions to help you in ANY emergency situation! The USB car charger plugs into the 12 volt DC receptacle for charging cell phones and tablets. Easily locate the USB port in the dark with the Glow-in-the-Dark band. It also charges the internal battery as this unit has a 1400mAh power bank built in for portable charging. Will charge most cell phones twice when fully charged. The super sharp seat belt cutter cuts through a seat belt in just one swipe. 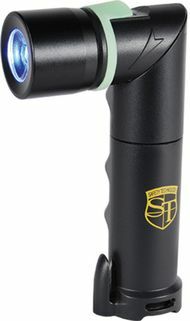 There is a bright 120 Lumen flashlight with an adjustable neck. It also has a red flashing light for signaling. Use the magnet on the bottom of the auto tool to mount to your car. 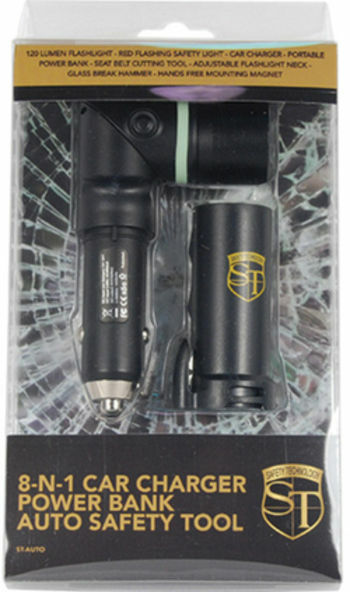 The built in glass break hammer is hidden in the positive pole of the car charger. Just aim for the corners of the windows where the weakest points of the window are and swing the glass breaker into the window to escape from the car.